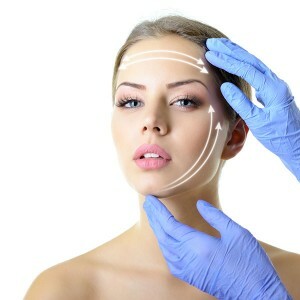 I am often asked about the differences between a liquid facelift and a short scar facelift, so I decided to author a blog post highlighting the two popular facelift options in order to provide prospective patients with a better understanding of both procedures. A liquid facelift is really just a way of “lifting” and “filling” the soft tissues of the face with injectable fillers, and sometimes even fat transfer, in order to get improvements. With this technique, I can typically disguise jowl formation and improve loss of volume that occurs with facial aging in the smile lines (nasolabial folds) and corners of the mouth (oral commissures), as well as the area along the jawline in “front” of the jowl (pre-jowl recess). For a liquid facelift, the recovery process is essentially the same as recovering from a dermal filler. Most patients can typically expect swelling and bruising to variable degrees for a few days, and it may even cause one to miss a party that same day, but otherwise, there is essentially no down time associated with this technique. A short scar facelift is often performed as an office-based procedure, meaning patients no longer have to go to a surgical facility and stay overnight following the operation unless they choose to do so. Incisions are well disguised in front of the ear and under the sideburns, as well as a small incision under the chin. I try to avoid much of the traditional “behind the ear” incisions that are typical of most traditional facelifts. This is also the area in traditional facelifts that has the hardest time healing – another reason I like to avoid it. During the procedure, which typically takes about two hours, I will lift and tighten the deep tissues of the cheek and jowl, tighten the neck muscles under the chin (the sling-like muscle called the platysma that envelops the neck), remove and sculpt any fat deposits along this muscle which can cause unwanted fullness of the neck and chin, and lift the skin of the cheek in order to achieve a more natural-looking, longer-lasting result. I am significantly “less aggressive” with this technique as compared to other, more traditional facelifts that require a much longer time to heal and recover. A standard, classic “full facelift” can require as much as 3-4 weeks to recover. My patients are mostly recovered, sutures out, and very presentable at 7-10 days. For more information about our facelift options, or to schedule a consultation with Dr. Boynton, please contact our office today.